It was a warm night in Boston, but it was steamy inside the House of Blues! It could’ve been due to the humid summer we’ve been having, but more likely lead singer Mike Ness was the cause of getting the girls hot and bothered. I’ve never seen it happen there before, but there were even several fainters who had to be helped out of the audience that night. Social Distortion was there to celebrate the 25th anniversary of their self-titled album. They played all the much-loved tunes from the album plus a few more favorites, including some great covers; Wild Horses (Rolling Stones) Alone and Forsaken (Hank Williams “the original punk”), Folsom Prison Blues and Ring of Fire (Johnny Cash). 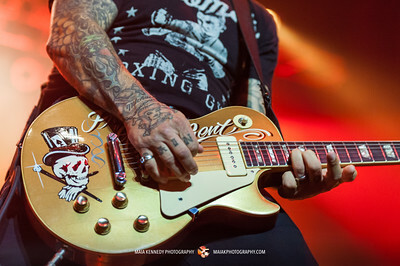 Ness looked and sounded pretty tough, resembling a 1950’s rockabilly-musician and revealing tattoo-covered muscles. His lyrics expose him as a sensitive poet though, writing about the hardships of life and love. He talked about how he has been criticized for not being punk enough and not following the "rules" of punk-rock, but that only encouraged him to break the rules more, writing love songs and covering Johnny Cash. He also mentioned writing about racism and people talking behind your back. He felt that his words would have a greater impact in songs than they would in a shouting match with someone. And the words he wrote then, sound just as relevant today. Have you ever been ashamed and felt society try to keep you down? Mike Ness didn’t choose his opening bands at random. Like himself, all the musicians were clearly more than just basic punk rockers. They demonstrated an appreciation for the history and evolution of American music, weaving the threads between punk, country, rockabilly, and stripped down rock & roll. Drag the River, an alternative-country band from Colorado, started the show. All coming from earlier punk-rock bands, these guys play a more mature country-rock now. Switching easily from laid-back country-rock to harder rock sounds, they got the audience in the mood for more. Nikki Lane and her band followed with a more traditional country sound. I looked around the audience occasionally to notice peoples’ reactions. I had been surprised actually that the house was so packed before the headlining act. I had incorrectly assumed that the two country bands wouldn’t provide the draw for Social-D, who I associate with the punk crowd. This audience came early though, drinking in the bands’ music along with their beers, both flowing easily. Near the end of the show, Ness asked the audience to show some love for the opening acts (meaning: visit the merch table), said he chose them specifically so the audience would get “more bang for their buck.” Ticket money was well spent, it was a great night, and music from all the bands fit perfectly together. After the encore, many from the audience stayed hoping for more. Dave Hidalgo, Jr. came out then, fashionably attired in his Boston Red Sox team jersey and threw his drum skins out to eager grabbing hands. The hometown fans went wild; the House of Blues is right across the street from Fenway Park’s Green Monster. I’m looking forward to a new album from Social Distortion, rumored to be coming out in 2016. And I can’t wait for them to come back to Boston to promote it! All the bands would be eagerly welcomed back!